Karlsruhe is widely known for its duotrams, which run both on regular tramways and on the mainline railways with trains. Less well-known is the odd little transport jewel hidden away in the Durlach district there. 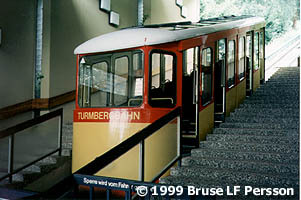 In May 1887, the engineer Karl Müller from Freiburg began construction of a funicular from Durlach up to the outlook tower called Turmberg. The line was inaugurated on 1 May 1888 with a gala celebration. It was operated by Turmbergbahn Durlach AG. The meter-gauge railway was double-track, with a maximum gradient of 36.2% and a speed of 1.5 meters per second. The cars, built by Maschinenfabrik Esslingen, were open, and could carry 49 passengers; they were also equipped with 5000-liter water tanks. 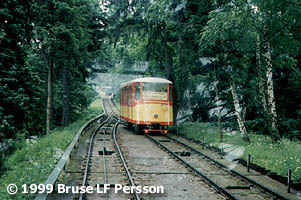 The cars were run thus: The upper car's tank was filled with water, and the weight caused it to run down the mountain along the railway. At the same time, the lower car, with its tank empty of water, ran up the railway. When the car with water reached the bottom, the tank was emptied and the whole procedure was repeated. How much cheaper can motive power get? In 1966 the line was completely rebuilt. Among other changes, it was made single-track with a passing track at its midpoint. The water power described above was replaced with a 440V, 62hp (45.6kW) DC motor. This raised the maximum speed to 2 meters per second. The new cars are enclosed and can carry 60 passengers. The line is now run by Karlsruhe Verkehrsverbund (KVV), the same company that runs the duotrams. All photos taken on 8 June 1996.